Today, millions of Christians worldwide will be celebrating our risen Lord and Savior during the Christian holy day of Easter. I prefer to celebrate His resurrection as foreshadowed during the Lord's Feast Day of Firstfruits. Please don't misunderstand me; I do not judge anyone who celebrates Easter; I know that they are celebrating Jesus's conquering of Death. 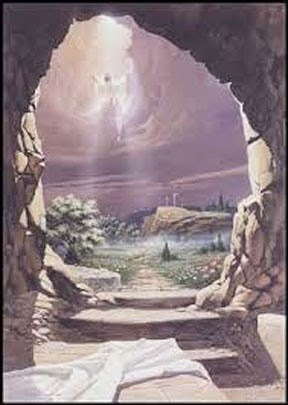 But I doubt that any Christian could show me where, in the Bible, God or Jesus refers to a holy celebration of Easter. (In fact, I would challenge them to study the history of Easter). For me, I just find that the Resurrection has so much more meaning when reflected upon through the context of God's commanded statutes. The regulations for Firstfruits were outlined by God in Leviticus 23. I would venture to say that most Christians skip this chapter of the Bible, labeling it as laws that pertained to the ancient Israelites; too restrictive; too discriminatory; or just plain unnecessary for the modern Believer. But if you do a deep study of the Word, you will find so much significance for this season of worship. Firstfruits was essentially the beginning of the grain harvest in Israel, and on this particular day a specific sheaf of barley, which had been marked for this occasion, was to be brought to the priest at the Temple, who would wave it (or exhibit it) before the Lord for acceptance. It was representative of the barley harvest as a whole and served as a pledge or guarantee that the remainder of the harvest would be realized in the days that followed. Accompanying this time of worship were other offerings to the Lord ... an unblemished male lamb, a drink offering of wine, and a meal offering of the barley flour mixed with olive oil (an unleavened bread). Are you starting to get the picture? During this holy season of worship, Jesus, our High Priest, can be seen in all the pictures of the Passover week ... as the sacrificial lamb; in the wine offering which represents His blood spilled for us; in the unleavened bread (leaven represents sin in the Bible and Jesus was without "leaven"); and as the climactic event, He is the First to be raised from the dead. He is representative of the harvest of Believers as a whole, and His resurrection serves as a guarantee that all those who believe and trust on Him will be harvested to resurrected glory as well. He is the beginning (Firstfruit) of God's final harvest of all mankind. And if you still can't grasp the prophetic meaning of this holy day, consider this: after his death and burial, Christ rose again on the third day of the Passover season, on the very day of the Feast of Firstfruits. Do you think that this was coincidental? I am just overwhelmed with "the picture" of His salvation plan that God has given us through His Feast Days. If we truly meditate upon them, we will realize that they are more than just ancient rituals. They point to Christ at every turn. I am eternally grateful for Jesus's sacrifice for me; and I take the Lord's Supper with an eye towards the multi-level significance of the wine and bread; and most of all -- today -- I eagerly look forward to the Father's reaping of souls and I thank Him for showing us the picture of what that harvest will look like through the resurrection of His Son ... the Firstfruit of all who will follow Him.